The hubby is a microbiologist, who counts the number of bacteria in food for a living (among other things). One day we were having dinner at a restaurant which faces a couple of fast-food chains and thus led to this conversation. Hubby: Do you know that if a burger is brought into our labs, it will fail the test if its vegetables are in it? Hubby: Because they don't cook the veg, so it has a lot of bacteria. This is why I don't eat fast-food. Me (eating my salad): Is it? Never thought of that.. though it makes perfect sense. Hubby: And you know what is funny? The healthiest item on the menu is the salad but it is also the one with the most number of bacteria! And this, my friends, is a classic example of what I like to call 职业病 or "job hazard". It is of my opinion that everyone has their own form of "job hazard". Teachers like to correct other people's grammatical errors, lawyers like to point out what's legal or not and researchers, well, we like to debunk (or support) myths and back it up with random numbers we like to call statistics. Speaking of which, did you know that approximately 150,000 deaths & 5 million illnesses can be attributed to climate change each year? This lends support to the phrase that we often hear people (including me) say when someone is sick, "Hey you're sick? It must be the weather!" 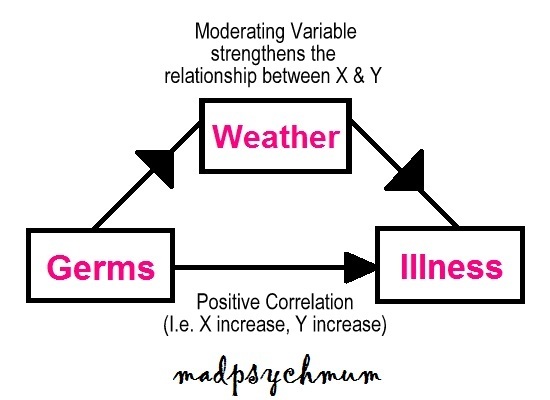 In actuality, the changing weather is only the moderator and not the cause of illnesses. Let me illustrate this with a diagram we often use in our psychology statistics class. Bacteria is the mastermind behind the whole operation but the weather actually aids it. Bacteria live twice as long during monsoon seasons and in the right warm conditions, a single baterial can multiply into 131,072 bacteria! Hence, besides loading up on vitamin C to boost your immune system, you'll also need to wash your hands with anti-bacterial soap regularly before meals and after using the toilet. Disclosure: This is Part 2 of a series of sponsored stories on behalf of Lifebuoy Singapore. However, all opinions & text are my own.